Sassy Find for the Month of Dec. | Sass a Craft - Muslim Women are Smart & Crafty Too! I was extremely elated when I saw this cheap and sassy accessory in the sooq last week, (Sitteen St. across from Steps Shoe Store). Several colors and styles are available from Hot Pink hearts to Beige squares – so cute, Maa Shaa Allaah! 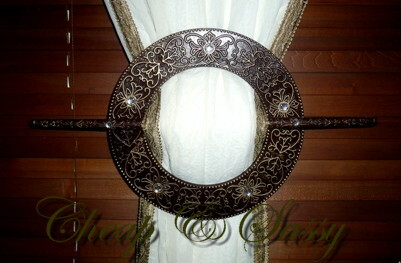 Sassy Tip ‘O Mine: An extra-large wooden hair accessory makes a great plan B so long as your curtain isn’t too thick. I was about to DIY this but stumbling upon a bigger and better one suited my fancy. This beats those tie backs that are drilled into your walls any day. where can i buy this? Please help!!! this is what i am looking for in a long time. please send your response to(). The sooq is on Sitten St. (across the street from Mustashfaa ‘Irfaan). There are many, many stalls selling these tie backs. Sorry, I don’t know the names of these stores.